Musical Swings Coming To Cadillac Square! Red Bull House of Art will present our first selection of nationally curated artists at the Residency 1 Exhibition at 1551 Winder in Eastern Market on Friday, April 29th. Katy Ann Gilmore, Carl Rauschenbach and Scott Vincent Campbell will share the fruits of their labor and culmination of their three-month stay in Detroit. Join us to celebrate their success and inspiration as artists, entrepreneurs and creators! The three resident artists have lived and worked together for nearly three months in preparation for the April 29th exhibition. The artists come from diverse backgrounds and use a wide range of materials to create their work. Gilmore is a visual artist currently living in Los Angeles; she is heavily influenced by topography and the relationship between 2D, perpendicular planes and their distortions into 3S space. Rauschenbach lives in New York but is originally from New Zealand. Skate and graffiti culture resonated with him early in his career, and continue to inform his work. Campbell is a visual artist and curator based in New York City. He uses a variety of mediums to examine how personal experience and constitution shapes the way people interact with other individuals and greater society. Rauschenbach and Campbell have both expressed interest in re-locating to Detroit at the completion of their residency. Following the April 29th opening, the gallery is open each Saturday and hosts a variety of events in-between residencies. 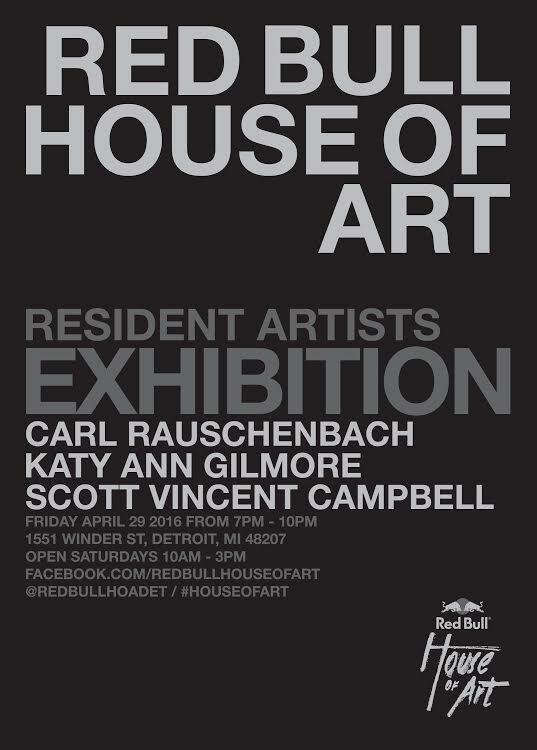 For up-to-date information about Red Bull House of Art, visit redbullhouseofart.com. Extended bios for all artists are available. All of the work was created during the artists’ 12-week residency at Red Bull House of Art. There will be an invite-only opening on Friday, April 29 from 5-7pm. This press release counts as your official invite — hope you can make it! The public gallery opening will be Friday, April 29 from 7-10pm. It is free & open to the public (all ages).